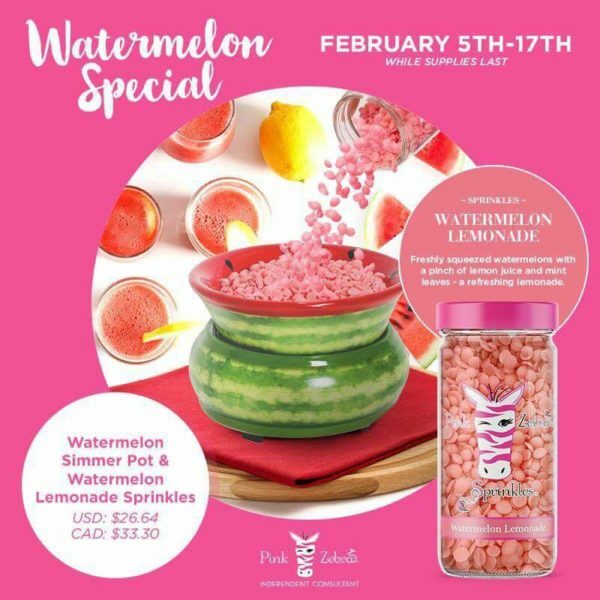 It may be cold where you are at but this darling new Watermelon Warmer from Pink Zebra will brighten up your kitchen, office, living room, anywhere you want it to feel and smell like summer. Our new Watermelon Warmer comes with the exclusive scent of Watermelon Lemonade Sprinkles. Nothing better than the smell of summer fun to brighten up your winter day. Imagine sitting on the front porch with a glass of lemonade in your hand, the sunshine rays peeking thru the trees, the sound of laughter in the background…..I can feel it all now. This cute Watermelon will only be around for a few days so get yours quick! Available from Feb 5th-17th.